Welcome to my Playmatic pinball repair pages..
Playmatic is a Spanish pinball company. The company made pinball machines from 1974 to 1985. Here is IPDB entry of all the games they made. More information about Spanish manufacturers can be found at the spanish site Pinball Hispano. The company started at the end of 1977 to produce solid state pinball machines, their first one was Space Gambler. Interesting to know is that, similar to other European pinball companies like Recel and bingo manufacturing companies like Wimi, the playfields are not regular wood with soft varnish like USA-made pinball machines. The playfields have a sort of plastic coating which makes them almost indestructable. You will have to search very hard to find a Playmatic machine with a worn playfield, and after cleaning most playfields will look brand new again. Playmatic first solid state pcbs. 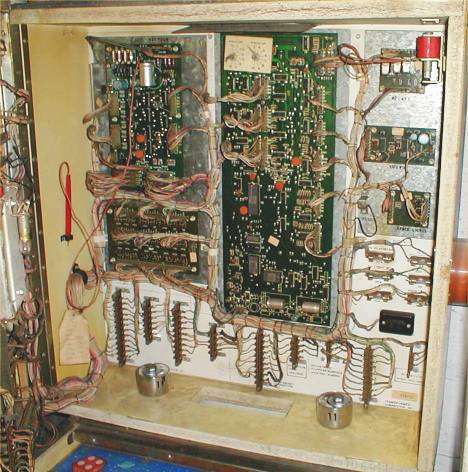 Notice the connectors to the playfield are still jones-plugs like electro-mechanical pinball machines use. Playmatic also used LED displays and not high-voltage display tubes like American pinball companies did . 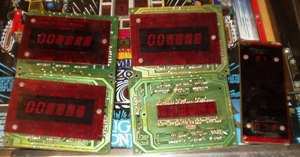 Here are some pictures of the pcbs used on Space Gambler. Some information I found: CPU's operate on +12V CMOS, you cannot replace the 1832 ROM's with 27xx 5V EPROM's. The 1832 has not been manufactured for nearly 20 years, so pray that your ROMs are OK.
Playmatic System 1 games are now running in PinMAME. The team working on this need your help. If you own a Playmatic machine, please email me, or contact the team on www.vpforums.org and www.pinmame.com. Manuals are needed (with the layout of switches, lamps, solenoids) and it's even better if you can read out the eproms.
. According to the schematics the ROMs are ICs 26, 30, and 35 for ROMs A to C. C does not exist on all machines either. All information you find here is scanned from the manuals of pinball games Space Gambler, Antar and Big Town. Both are from the late 70ies (1977-78). I decided to OCR them and put them online, as I did not find any other information on the internet about Playmatic (solid state) pinball machines. Most people don't care for Playmatic machines, as they believe they can't be repaired, because no-one knows about them. All the pages of the manual have been OCR'ed and transferred to HTML code by me. Some errors may still remain, if you doubt about something then let me know and I'll check against the original manuals. Usual errors were things like 1K (ie with resistors) which have become IK after ocr'ing. I have proofread and corrected a lot but some errors may still be in there.. If you really have problems or questions with the schematics then I can always check the original paperwork, in case something wasn't scanned correctly. However I don't have a lot of time to it can take a while. And I can't help you much further with repairing your machine. I had a Space Gambler once, couldn't fix it, searched for this documentation, and then sold the machine. So don't ask me very specific questions about how something is supposed to operate, I don't know either. Have you found something then let me know so I can update this page. Continue to the scanned Playmatic manuals and repair guides..